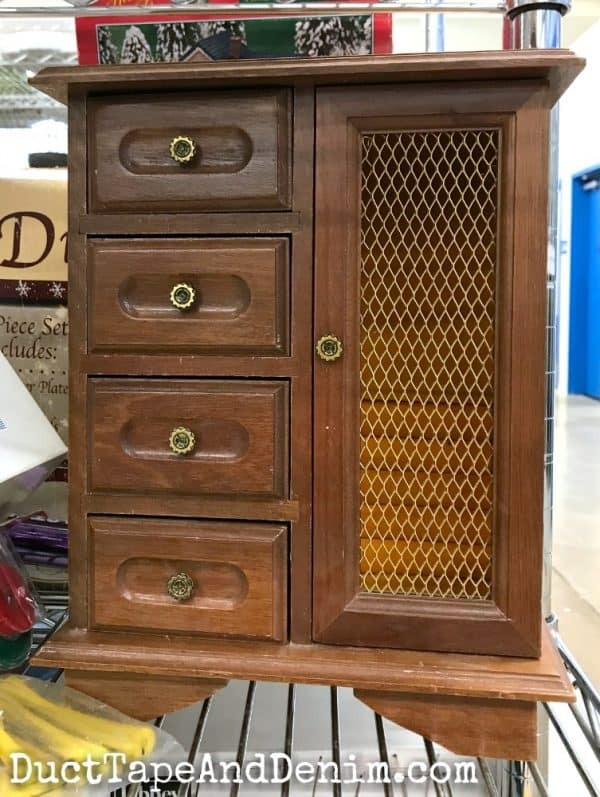 Welcome to our monthly thrift store challenge! 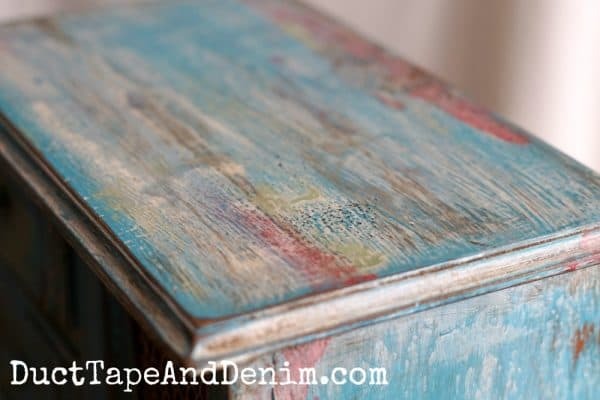 Today I’m sharing my current favorite paint finish… I’m calling it a boho paint finish. This is out of the box for me! I’m working on expanding my color palette and this finish definitely expanded it! After you read my tutorial, make sure you scroll down to see what everyone else in the challenge made this month. Here’s what the jewelry cabinet looked like when I found it at the thrift store. NOTE: Now available in my Etsy shop! So take a look if you don’t want to paint one for yourself! Scroll down to watch the video. It’s long but it might be easier to understand the steps. 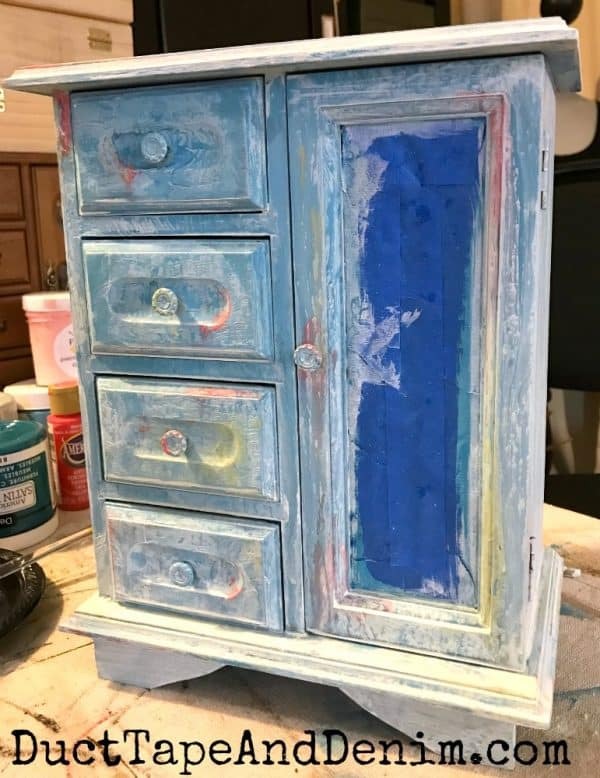 I started by cleaning the jewelry cabinet with a damp rag and taping the areas I didn’t want to paint, including the wire in the door and the insides of the drawers. 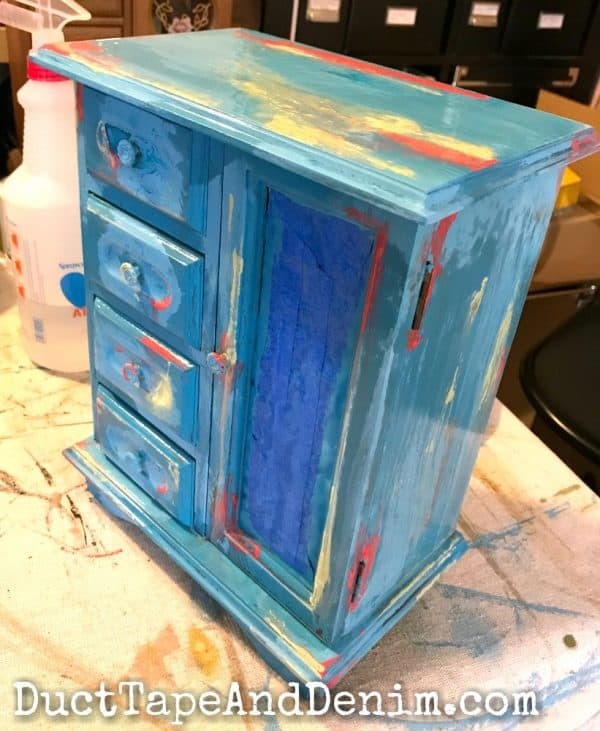 I painted the entire jewelry cabinet with the two blue paint colors, not cleaning my brush in between. While that was still wet, I came back with my palette knife and added the contrasting colors in random places. I sprayed it with water and smeared it slightly with my palette knife. Notice I painted this with the drawers IN. I let the water drip down the sides and front. Honestly, at this point I thought I’d ruined it. Not very pretty, right? I used my heat gun to dry the paint, holding it close to the contrasting colors. The heat will make the acrylic and enamel paints bubble… don’t worry… that’s what you want. You can see this in the video below. When everything was dry and had cooled off I sanded it well with my sanding sponge. Next, I painted a thinned down coat of white paint over the whole cabinet. After it dried, I sanded again, focusing on the corners to give it a distressed look. See what a great texture the heat gun gives the paint? I love that multi-layered paint look. I did get a little crazy with the water bottle on this one and ended up getting paint inside the door. So, as you can see, I covered up the paint stains with some fresh felt. Thanks for reading! Now… check out what my blogging friends made! We join these blog parties. Featured on Crafty Weekends. I can tell you I was a little worried there for a minute with all those garish colors. Then you toned them down to something I could live with. Great project! lol.. Believe me… I was too! I almost quit in the middle of the project. Thanks for your question… I mix my paint with a glazing medium that keeps it from drying so quickly. Then I brush it on and wipe it off. The glaze settles into the details and makes them really stand out. I love it and boho is the “it” style of the moment it seems! 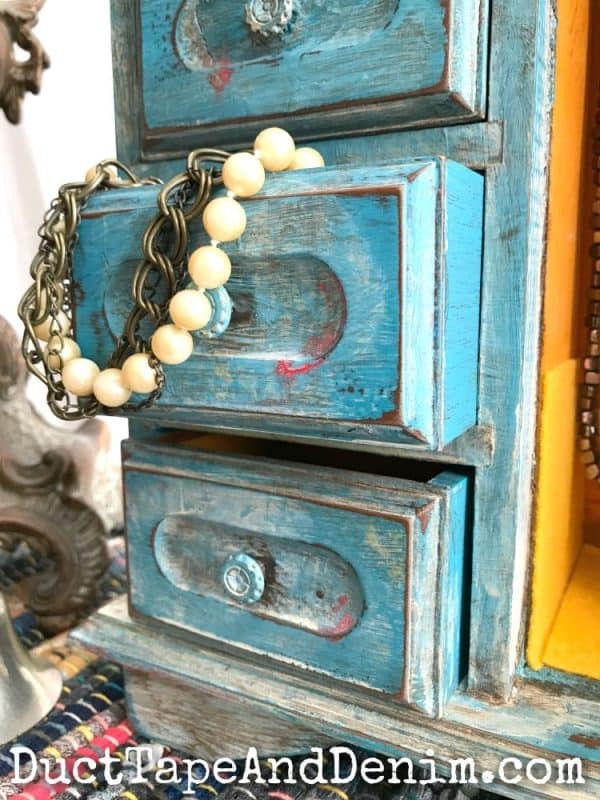 I can’t wait to see your next foray into boho! Wow!! That is a really cool technique! Kudos to you for being brave enough to do it because the final product is gorgeous! Very cool, great transformation! Love all the colors you used to make it look so old and vintage-y. Visiting from Thrift Store Challenge. I’ve never heard of boho paint before, but it came out great. The colors look amazing! Ann, I love it. That first photo was a little scary, but I knew you would come up with something to save the day, and you sure did. I like the way everything melds together. I like what you did with this finish. It really looks great and so current. Wow this is a great painting technique. I always tend to paint then distress but these results are stunning! 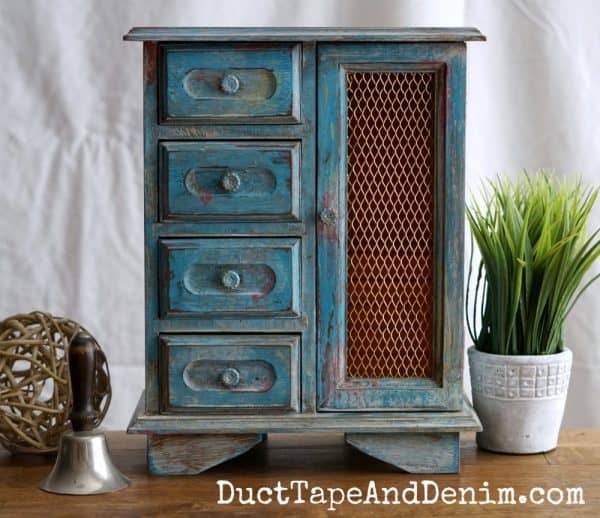 I love the blue with the contrasting colors and the fun heat tool texture. Ah-Mazing!!! Great color and fantastic job, well done. I love this paint style. I actually painted my front door very similar, but then decided that our house style just didn’t work with my paint endeavor, so I painted over it. I will have to try it on a smaller scale now. 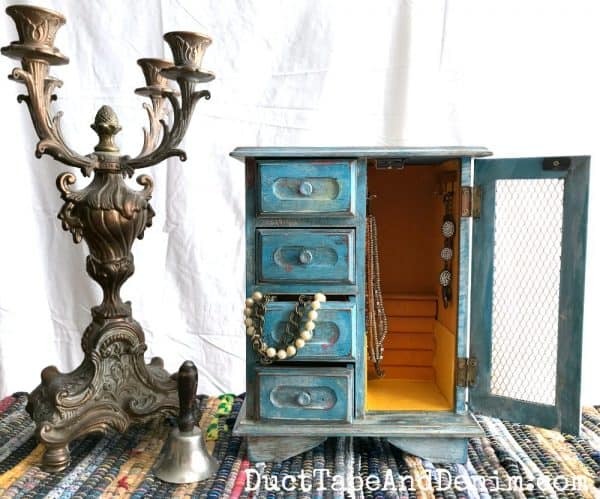 Anyway, I am featuring your jewelry cabinet makeover on this weeks OVER THE MOON LINK PARTY which goes live on Sunday evening at 6 Eastern. Thanks for linking up and join us again this week! Love it! Thanks for sharing at the To Grandma’s House We Go DIY, Crafts, Recipes and More Link Party! Hope to see you again this week! Fun technique! Thanks for sharing with SYC. Super cute. Thanks for sharing at Home Sweet Home. What a fantastic change, it is wonderful to take something old and make it new!! !